Theorists and experimentalists searched for compatible mates. Speed dating participants searching for a scientific match. Who needs a long walk on the beach when you can sip wine, gaze into a potential partner’s eyes and dream of all the things you’d like to do to their data? 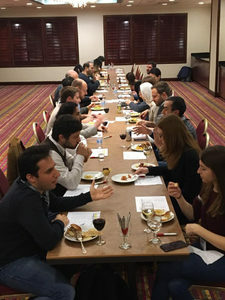 At the Computational and Systems Neuroscience (Cosyne) conference in Utah in February, 15 experimentalists and 15 theorists and data analysts pitched their talents in a speed-dating-style event. Each pair chatted for three minutes to figure out if they had potential for a scientific spark and then moved on to the next candidate. At the end of the event, participants chose three people they wanted to collaborate with. If the feeling is mutual, they will be matched with their selections. The event was conceived on the fly at last year’s Cosyne meeting by Andrea Giovannucci, a data scientist in the Simons Foundation’s Center for Computational Biology, and Jeff Gauthier, a postdoctoral researcher in David Tank’s lab at Princeton University. They were brainstorming ways to encourage shy scientists to connect, ideally in a structured format where people would give short elevator pitches about their work to many different individuals. Giovannucci originally proposed the speed-dating concept in jest, but the idea quickly caught on. Within 24 hours, the Simons Foundation team had put together the event, hosting 13 experimentalist-theorist pairs. Participants certainly had a lot to talk about — at the end of each round, most were reluctant to move on to the next candidate. Michael Kohl, an experimentalist at the University of Oxford, made a number of connections even before getting his post-hoc matches. “I plan to send five people my data, and two people will send me toolboxes,” he says. He particularly liked the mix of participants — mostly senior postdocs and junior professors. Indeed, most participants had a hard time limiting themselves to three matches. “Can I date more than three people?” asked Kamal Sen, a theorist from Boston University. Sen says that he wasn’t sure what to expect from the event, but found it surprisingly useful. “Lots of experimentalists are interested in the issue I am interested in,” he says. “How can cortical circuits process stimuli in flexible ways?” Rather than taking the traditional approach of focusing on a single sensory domain, Sen wants to look for common properties within different systems, in different paradigms and different sub-populations of neurons. That requires collaborating with experimentalists using a variety of approaches. We hope the budding relationships sparked at Cosyne will develop into something deeper — maybe we’ll see some offspring, in the form of posters, at the meeting next year.